Back in March I purchased a Shimotsuke Kiyotake 240 rod on ebay for a ridiculously low price. 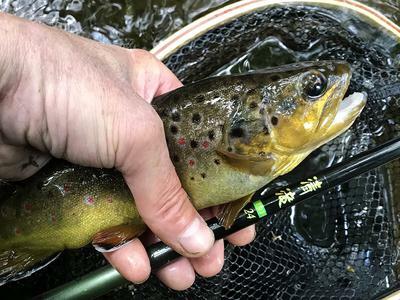 It sounded ideal for fishing the narrow, tree-shrouded urban streams I fish and so it proved.... over the spring and early summer I caught hundreds of beautiful wild Brown Trout both on this and the 180 version of the same rod (which I bought a few weeks later). Although weighing only 1oz, the 240 could easily handle fish up to 14 inches and both rods were so cheap that I had no hesitation in using them in 'challenging' situations. By July I'd decided that the only downside to the rods was their stiffness: in Chris's 'common cents database' the 240 weighs in at 15 pennies, which makes it stiffer than just about any other rod in its length class. The practical considerations of this were: a) casting was not really accurate or pretty — I'd just flick/lob a small bead-head nymph into the general area I was fishing and hope for the best... and b) although the rods were great with bigger fish (8" plus) I lost count of the number of 4" to 6" fish that would wriggle off my (barbless) flies at the last moment. So... in August I decided to buy the highly rated Nissin Airstage Hakubai 240 to compliment my small stream set up. Including shipping, import duties and taxes, it worked out roughly four times more expensive then my Shimotsuke 240! I chose the stiffest of three versions Nissin offers for each length of the Airstage Hakubai (the medium-stiffness version of the 240 sold by Chris has a common cents rating of only 7 pennies, which seemed a little on the soft side for my requirements). Chris hasn’t rated the stiffest version of the 240 on his database but presumably it’s somewhere in the 9-10 penny range? Whatever…it’s noticeably softer than my Shimotsuke Kiyotake 240. 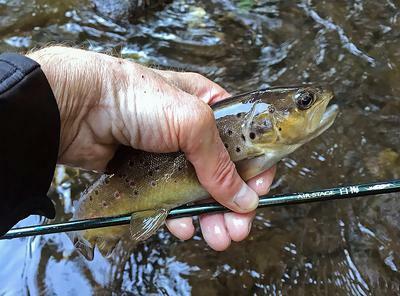 On my first day’s fishing with the Airstage I successfully landed a number of small brownies, some of which were so tiny I don’t think I’d even have felt the bites on my Shimotsukes, and since I’ve also been continually amazed at how accurately and delicately it casts tiny dry flies. But…where bigger fish are concerned (10"-12”) I definitely lose more mid-fight with the Airstage than I do with the Shimotsuke 240 and I can only presume that the softer rod can sometimes make good hook-sets harder to get and maintain during the struggle. I’m not sorry I bought the Airstage — it’s beautifully made, unbelievably light and a true joy to fish with, but it just goes to show that in many situations there is no single ‘perfect’ solution. Hi Pete. One thing you might want to look at is your hooks. They need to be sharp. Not all are right out of the box, so you might want to run them across you thumb nail and if they don't dig in sharpen 'em. Hook sets even with a softer rod will be improved. Second, pinch down the barbs. I've done this since starting fly tying in 1970-something. It makes them slide into flesh better (and out of your sweater), and they hold as well as barbed hooks in my experience. Thanks for the tips but the flies I use exclusively now all feature high quality barbless wire hooks (not the cheap, crimped-down barbed hooked flies I used earlier in the season) so I'm not sure that's the problem. Maybe I just need to learn how to play the bigger fish with the Nissin a bit more skillfully. As you indicated, these are two very different rods for two different purposes. I own both and have used both, many times. I like them both, but the Nissin Air Stage Hakubai 240 (at least the one Chris sells) is a more refined, much softer, full flex rod. It excels at micro-fishing--really meant for those tight spots where you're pretty sure you're going to catch small fish. You definitely want to protect it with soft tippet. The Shimotsuke is better suited to those tight situations where you're not sure what size of fish you might catch (within reason). It's not as nice to cast as the Air Stage, nor does it provide the same tactile experience. But that's not its purpose or price point. I definitely agree with Herb--stick with very sharp, name-brand hooks. I would say as a general rule that a soft rod almost demands extra-sharp hooks. Good article--I appreciate your thoughts. I have the Airstage 240 and love it. Its my primary microfishing rod and small tiny creek rod. I use only 2lb fluorocarbon as line, so if I do hook a large fish the line will break before the rod. The fluorocarbon doesn't give you a lot of casting distance but with a rod this size you don't need it if your fishing tiny creaks or streams. I have caught fish up to about 8 inches and was OK because I knew the line would break before the rod. But if you haven't taken up microfishing, maybe you should try it with the 240 and who knows you might get hooked. When the trout turn off, I always carry my 240 for micros and always get fish, tiny but a day where I don't get skunked. Thanks for all the advice and ideas. The Trout season is all but over in my part of the world (just one week to go) but I'll be well prepared next spring. The beauty of all these rods is their size, weight and ease of stowage — carrying and using all three on the same day is no bother at all. I just have to learn to identify which bits of water are more likely to hold the smaller fish, and which the bigger! PS. The stiffest version of the Airstage 240 is apparently rated for tippets up to 6x (.6 Japanese size), which is what I've been using so far, but I might go lighter than that next year in order to err on the safe side. Pete- You said your season is over next week! What a bummer. One of my favorite seasons is late fall and winter fishing for trout. Most of our streams where I live are open year round. My favorite winter stream is closed in the spring for rainbow spawning, but in the winter big lake fed rainbows follow the suckers up into the South Fork of the Boise River to feast on their eggs, not size 240 fish, but at least 4.5 meter or longer rod fish! Several small streams will be much more fishable in about a month because the foliage will have dropped from the streamside. There is a "no tell'm creek" where my Shimotsuke Kiyotake 240 is the perfect rod. I'll be fishing it next month through next spring. 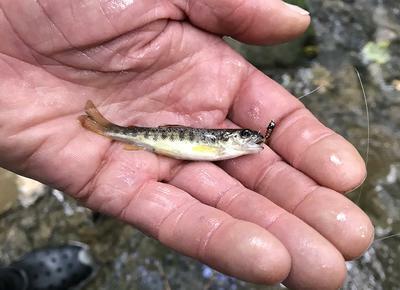 The trout are too stressed in the summer due to low water and warm water. I caught a 13 incher last year. Most go 4-6 inches. Last but not least, the rattlesnakes will be in hibernation. 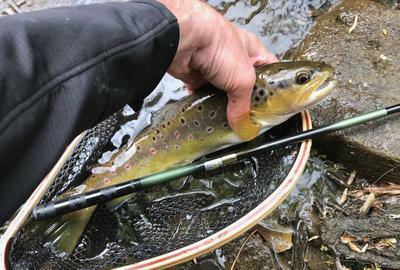 Although the wild brown trout season here officially finishes at the end of September, the bigger rivers here are often multi-species, so it's legally OK to continue fishing right through the winter, even if you catch the odd OOS (out of season) brownie. The vast majority Rainbows here are artificially reared in reservoirs and lakes, and these places usually have slightly extended seasons — typically March to October.